There has been a legend in my family, passed down from generation to generation, about my third great-grandfather Nathaniel Lewis. According to family folklore, his name wasn’t originally Nathaniel Lewis, but rather, Nathaniel Levi. As the story goes, our Lewis ancestors were Jewish people who converted to Christianity and changed their name from Levi to Lewis. I had always wondered if this family story was really true. Everyone in our family has been told this legend but no one really had any conclusive evidence — just small clues. My grandmother and her siblings remember their mother singing Jewish songs to them as children. We also have an old newspaper article about our ancestor that states in passing ‘Nathaniel Lewis has lived in Scotland for many years but has no Scot’s blood’. Many of my relatives have speculated that this statement reveals that although Nathaniel was of Scottish nationality, he had a different ancestral background — Ashkenazi Jewish. However, conclusive evidence about this hypothesis was lacking until I joined 23andMe. When I first joined 23andMe in 2009, Relative Finder was just being introduced and the Ancestry Finder feature did not yet exist. As I corresponded with my Relative Finder matches, I noticed that many of my potential relatives said that they were of Ashkenazi Jewish descent. I wondered if this high number of Jewish Relative Finder matches was typical for someone with Northern European ancestry, so I turned to the 23andMe community for help and posted my questions on the community forums. I communicated with fellow 23andMe users and quickly realized that my genetic profile wasn’t typical for someone without any Jewish background. Instead, my DNA confirmed the old family story and indicated that it was highly likely that I do have Jewish ancestry. Here is my Ancestry Finder, with the settings set to focus on the Ashkenazi Jewish segments. The blue spots are regions where a 23andMe customer shares a segment of DNA with me AND has stated that he or she has Jewish ancestors.. 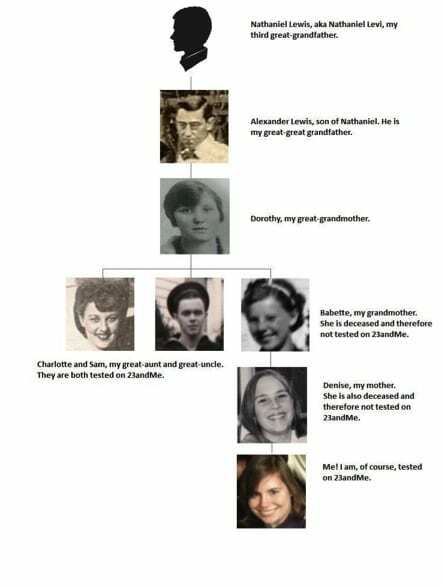 I decided to get my great-aunt & great-uncle from that side of the family tested, to see if they also had evidence of Ashkenazi Jewish admixture. Right around this same time, Ancestry Finder, which has a specific section dedicated to Jewish ancestry, was introduced. This feature was also immensely helpful in my quest. As I expected, my great-aunt & great-uncle also showed significant Jewish ancestry — more than I have, because they are two generations closer to our Jewish ancestor than I am. For the first time, thanks to DNA testing, we actually have clear evidence of a Jewish ancestor in our past. Without 23andMe, I might never have known if there was any truth to this family legend. Why did the Lewis family feel the need to convert from Judaism to Christianity and change their name? I am actively searching to uncover this information, but much of Nathaniel Lewis’s life story has likely been lost to history. However, his DNA lives on in his descendants and provides clues about his background. Often, when traditional genealogy methods fail, you can turn to DNA to uncover more about your ancestral heritage. You never know what sort of surprises can be uncovered! When she is not performing genetic comparisons on Family Inheritance Advanced or answering questions on the 23andMe community forums, Andrea Badger attends college at the University of Washington and will be receiving two bachelor’s degrees in June of this year. 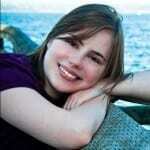 She writes the genetic genealogy blog at www.andreasancestors.com.